In the brave new Japan of the 1870s, Taka and Nobu meet as children and fall in love; but their relationship will test the limits of society. Unified after a bitter civil war, Japan is rapidly turning into a modern country with rickshaws, railways and schools for girls. Commoners can marry their children into any class, and the old hatred between north and south is over - or so it seems. Taka is from the powerful southern Satsuma clan which now dominates the country, and her father, General Kitaoka, is a leader of the new government. Nobu, however, is from the northern Aizu clan, massacred by the Satsuma in the civil war. Defeated and reduced to poverty, his family has sworn revenge on the Satsuma. Taka and Nobu's love is unacceptable to both their families and must be kept secret, but what they cannot foresee is how quickly the tables will turn. Many southern samurai become disillusioned with the new regime, which has deprived them of their swords, status and honour. 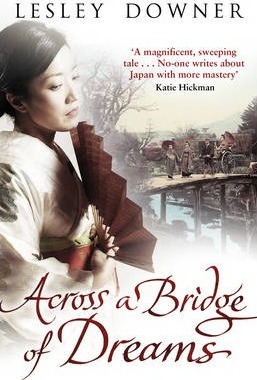 Taka's father abruptly leaves Tokyo and returns to the southern island of Kyushu, where trouble is brewing. Lesley Downer's mother was Chinese and her father a professor of Chinese, so she grew up in a house full of books on Asia. But it was Japan, not China, that proved the more alluring, and she lived there for some fifteen years. She has written many books about the country and its culture, including Geisha: The Secret History of a Vanishing World, and Madame Sadayakko: The Geisha who Seduced the West, and has presented television programmes on Japan for Channel 4, the BBC and NHK. She lives in London with her husband, the author Arthur I. Miller, and still makes sure she goes to Japan every year.